Lalah Hathaway performs a Tiny Desk Concert on June 12, 2018. 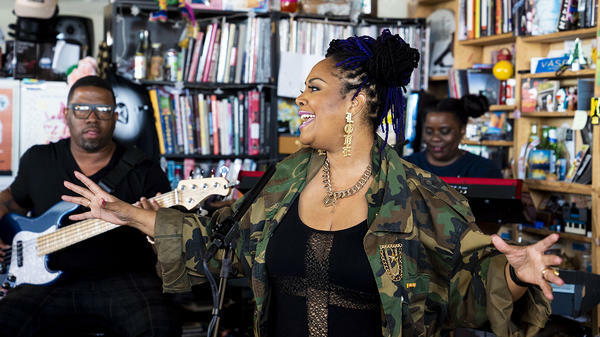 The younger Hathaway's appearance behind the Tiny Desk pulls back the curtain a bit for a close-up encounter with her powerfully expressive voice. The lower registers always draw me in, and in "Change Ya Life," Hathaway's dusky contralto paints an exciting portrait of blissful cohabitation — but on her terms. "I'm going to teach you how to treat me like I deserve," she sings, adding, "I'll give you the world." She draws on a tradition of romance and sensuality in the best soul music, but with a feminist twist that eschews old-school, male-centric lyrics and attitudes. Lyrics alone do not convey that kind of spirit. It's in Hathaway's delivery — self-assured yet vulnerable. "Boston," her ode to her second home (she's from Chicago), is a meditation on self-discovery and longing. The band — electric piano, bass, drums — perfectly straddles slow-jam R&B and a jazz-ballad sensibility. So much of the most powerful music from the Civil Rights Era wasn't about literal accounting of injustices; many of those songs enshrouded morality plays in the guise of romantic longing. Hathaway introduces the set-closing title track of her new album Honestly as an explicit reflection "of my country at this time." If you heard it for the first time without the introduction, it comes across as a lover's lament. But Hathaway's soaring vocals infuse it with the passion of resistance to bring her set to a close on a hopeful, joyous note. Lalah Hathaway (vocals); Lynnette Williams (keys); Eric Smith (bass); Varo Johnson (drums). Producers: Abby O'Neill, Morgan Noelle Smith; Creative Director: Bob Boilen; Audio Engineer: Josh Rogosin; Videographers: Morgan Noelle Smith, Khun Minn Ohn, Kara Frame; Production Assistant: Catherine Zhang; Photo: Eslah Attar/NPR.